The picture was taken in January. The list of vendors changed when we were at the Republic Cafe in April. A few weekends ago, Wolf and I went out to dinner with a bunch of friends to celebrate our birthdays. * I was pretty picky about which restaurant I wanted us to indulge at since I was asking friends to drive up from the Boston to Manchester to dine with us. I chose REBULIC Cafe for a couple reasons. First, we hadn’t been there before** and second, the owners use locally produced foods like Kelly Corner lamb, grass fed beef from Miles Smith Farm and lots of vegetarian choices for my non meat eating friends. As we were eating Lisa said to me “so what’s the reason you chose Republic? I know there’s a reason. You don’t make choices without trying to teach us something.” I told her about the locally sourced food and that it’s not a chain. 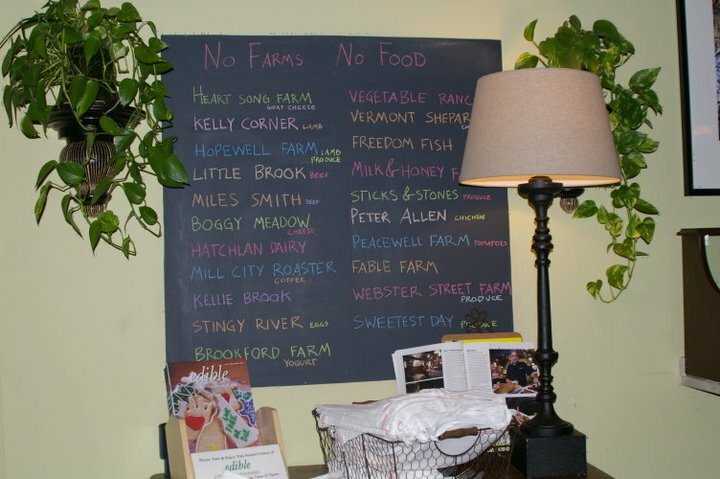 One organization dedicated to changing the lack of sustainability on our restaurant tables include American Farm to Table Restaurant Guide and NH Farm to Restaurant Connection. By seeking out places where local foods are served we can make positive changes to our local economies and the farm community in general. Eating at a restaurant is a luxury for Wolf and I so when we do we want to eat good food. Good local food. How about you? *Wolf’s is in December, mine in January. The original party we planned was canceled due to snow so we decided to reschedule for April when there was no snow. Of course, it rained. A lot. **We always have our party in Manchester because it’s in the middle of Boston and our home. It has great restaurants, most of which we’ve been to numerous times, so check out Downtown Manchester the next time you’re in New Hampshire. I love to see a restaurant that touts its locally-sourced foods. If nothing else it tells me that they care where the stuff they serve comes from. A place like that is bound to put something good on your plate.